All animals deserve to have welfare standards that meet their needs & protect them from harm. One very simple set of animal welfare standards is often termed the ‘Five Freedoms’. 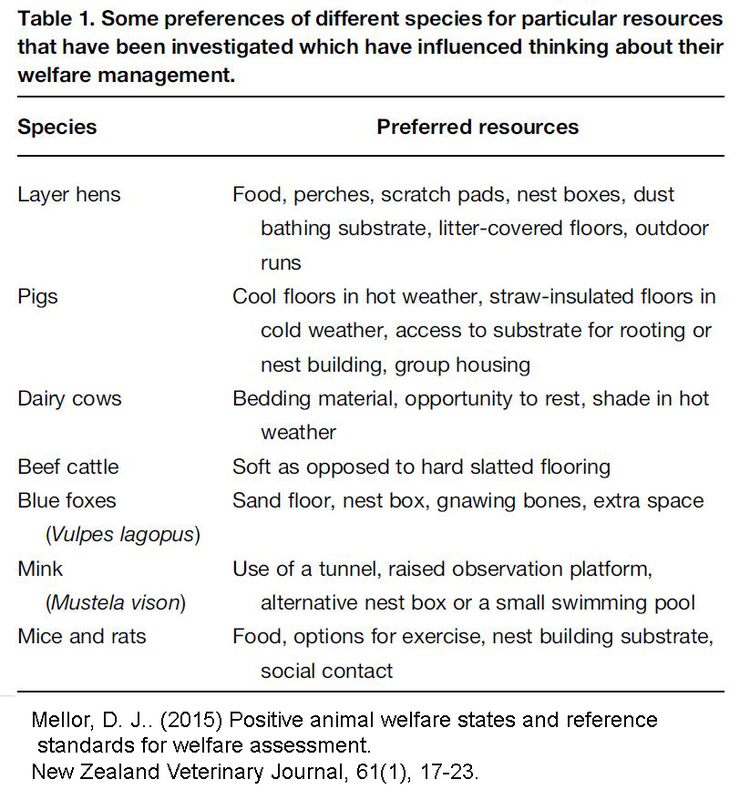 These are considered to be minimal requirements for an animal’s physical and mental well-being and have become the basis for more refined and updated models of animal welfare, such as the ‘Five Domains‘. ‘Welfare’ is the physical, mental or emotional ‘state’ of an individual as it attempts to cope with its environment. We can use a number of different signs and symptoms (indicators) that allow us to assess how well that happens. For instance, if the ribs of an animal were visible (a sign), that would be a physical indicator that the animal is perhaps experiencing hunger and thirst which are two ‘internal’ states (symptoms) that you can’t see. Behaviour can sometimes be thought of as a reflection of an animals internal state. For instance, attempts to move towards food or water, or rapid eating of food might reflect that the animal was hungry or thirsty. Other examples are injuries (signs) and pain (symptom). They both indicate that something is compromising welfare for the animal. Since individuals cope with difficult conditions in different ways, any single indicator can show that welfare is poor for that animal, or even across a group of animals. In some instances there are multiple indicators presenting at the same time. The ‘Five Freedoms’ were established in the 1980s and by 1997 they had been superseded by the ‘Five Domains’. The ‘Five Freedoms’ are recognised by the United Nations, the World Organisation for Animal Health (OIE) and the Terrestrial Animal Health Code 2010. Freedom from hunger & thirst. Art kindly provided by Lee Harrison. Freedom from pain, injury & disease. Art kindly provided by Lee Harrison. Freedom to express normal behaviour. Art kindly provided by Vanessa Chacon. Freedom from fear & distress. Art kindly provided by Lee Harrison. (by ensuring conditions and treatment that avoids mental and emotional suffering). 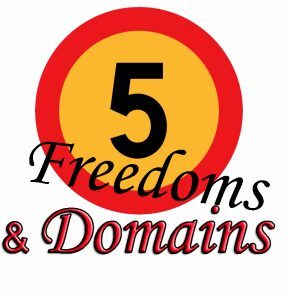 The ‘Five Domains’ were presented by researchers (Williams, Mellor, Marbrook & Stafford) in various publications and it can be seen how they are based on the ‘Five Freedoms’. 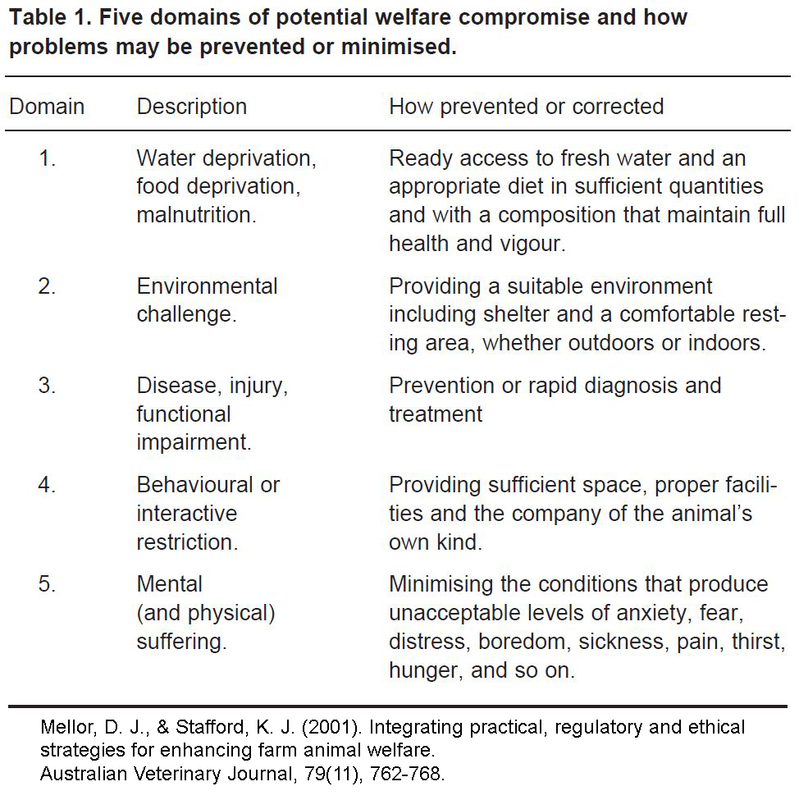 The ‘Five Domains’ draws attention to the potential for animal welfare compromise. They focus on the needs of the animal and how to provide for those needs. Both these models focus on minimizing or at best, neutralising, largely negative aspects of an animal’s environment by providing the basic necessities of life. However, more recent (2015) and more advanced ethical standards focus on Positive Welfare States, which we explain in more detail below. Animal welfare standards that focus on ‘Positive Welfare States’ are the more advanced and most current frameworks for animal welfare. They expand on the ‘Five Freedoms’ and the ‘Five Domains’ by including feedback from the animal itself. This includes what the animal ‘wants’. For example, if it was given a choice of three different cages, which one did it choose (want)? Choice has been studied in only a few species and for only a few aspects of their lives, but the research can be done. Some examples are given by Mellor (2015) in his Table 1, reproduced here. 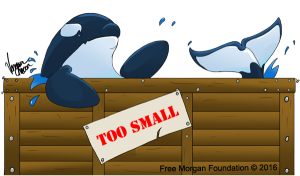 Unfortunately, cetaceans (whales, dolphins and porpoises) held in captivity, particularly those kept in concrete tanks, do not even have the most basic ‘Five Freedoms’ welfare needs met, nor the ‘Five Domains’ and certainly their ‘Welfare States’ are not addressed. Sign at Loro Parque, Tenerife, Spain, at the rear (north) entrance to the Orca Ocean stadium, where they conduct their circus-like shows. 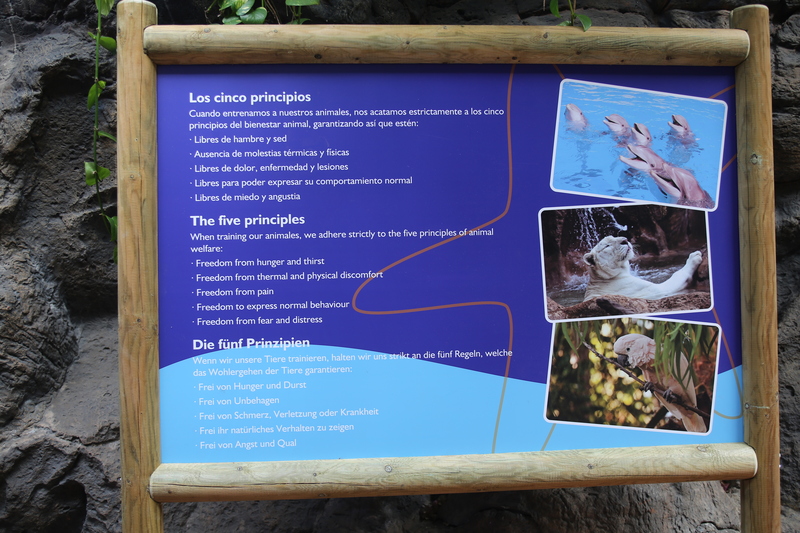 Loro Parque‘s interpretation has been modified from the Five Freedoms. Their modification, tellingly, excludes ‘Freedom from injury and disease’. We have evidence that the orca at Loro Parque have injuries (and disease) and this is presented on our ‘Veterinarian Inspections‘ page. Two of the FMF board members visited Loro Parque in April 2016 and they documented that at least four of the Freedoms were compromised during the shows that they watched (Visser & Lisker, 2016). 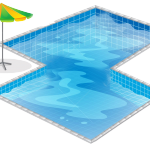 They also found that at least 23 of the C-Well® Welfare Measurements were violated. These C-Well® measurements are another set of welfare indicators, originally proposed for assessing captive bottlenose dolphins, but which can be adapted to other species. They were compiled by a team of researchers (Clegg et al. 2015) who used 11 Criterion, each using a different measure (indicator). But they only include four of the ‘Five Freedoms’, as their list doesn’t include the ‘Freedom to Express Normal Behaviour’. 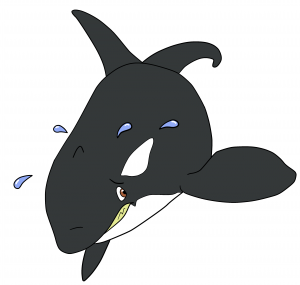 This Freedom is impossible to meet when keeping cetaceans in captivity. When inhabiting in their natural environment they live very complex lives and their needs can not be met captivity. Unfortunately, by excluding this basic welfare standard the authors have a set of welfare indicators that could be said are protecting the industry, rather than the dolphins. 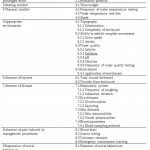 However, Clegg et al (2015) does include ‘Absence of abnormal behaviours’ (their number 10, Table 1) and measures this against ‘Stereotypic behaviour’ (abnormal and repetitive behaviour). 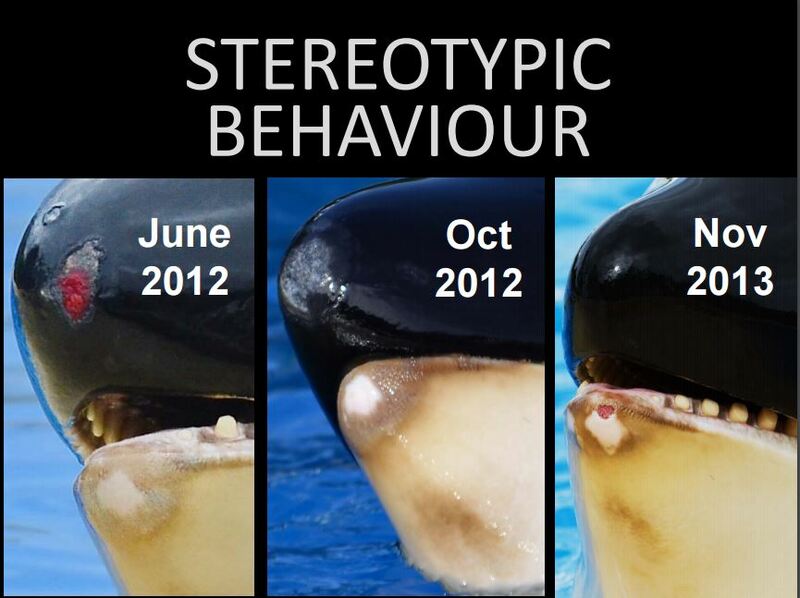 Stereotypies are observed in all captive cetaceans and are excessive at Loro Parque. Morgan shows a broad range of stereotypic behaviours, such as head-banging, chewing on the concrete and self-mutilation. The damage to her teeth is a combination of chewing on the concrete which results in self-mutilation. The hypertrophic tissue damage (the brown areas on her lower jaws) are a result of repeatedly banging her head on the tank walls. This results in permanent tissue damage and she often has open wounds as a result. The open wounds on her rostrum (tip of her ‘snout’) show that she isn’t just banging her lower jaws, but also her head. However, because this area of her body is black it doesn’t show the hypertrophic tissue damage like the lower jaws, but it is there, just under the skin. 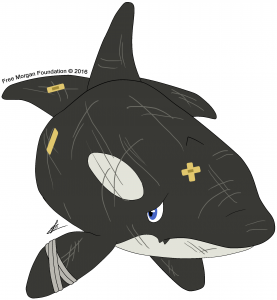 In summary, it is clear that keeping cetaceans in captivity goes against even the most basic welfare criteria. 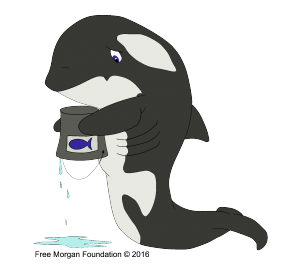 Keeping cetaceans in concrete tanks further compromises their well-being. The FMF has a very clear call to action; an end to this cruel, commercially-driven and completely unnecessary practice.